Mohiniattam is one of the most elegant classical dances of India that originated from Kerala.I It is also spelled as Mohinyattam. The other famous classical dance of Kerala is Kathakali. The word Mohiniattam is derived from the word Mohini which means female avatar of lord Vishnu. 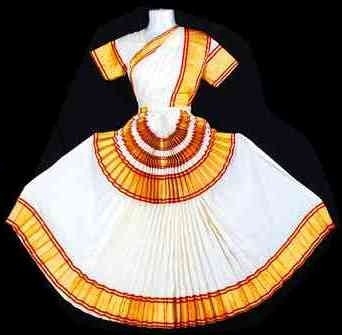 Mohiniattam is solo dance performed by women in most seductive and graceful way after extensive training. Of late even group dance is also performed. The music is usually Carnatic music with the dancer herself singing or vocalists sings for her. Like Bharatanatyam Mohiniattam also include seven elements like Cholkittu, Varnam, jatiswaram, padam and Tilana, Shlokam and Saptam. Usually the music is the mixture of Malayalam and Sanskrit language called as Maniparvala. This dance includes Lasya style of dancing done very gracefully. Mohiniattam also has its roots in Natya shastra written by Baratha Muni. It is a hindu text which deals with performing arts. During British period all the dances had a great downfall. However around 1930 Vallathol Narayana Menon helped to revive the dance after taking out the ban on temple dancing in Kerala. The theme of the dance includes love and devotion to God especially lord Vishnu and Lord Krishna. It is quiet similar to Bharatanatyam and Kathakali. The important postures include wide feet with bent knees protruding outwards. The dance includes Nritta and Nrithya. Nritta form of dance is rhythmic which appears at the beginning and at the end of dance form. In this the dancer tries to send a spiritual message to the viewers. In Nritya the dancers expresses the feelings and emotions silently with hand and facial expressions and body motions. Even this dance form has various mudras which are expressed in Hasta Lakshanadeepika. The instruments used in Mohiniattam include Mridangham, Idakka, Flute, Violin, Veena and Cymbals. There are four groups in Mohiniattam they are Taganam, Jaganam, Dhaganam and Sammmisram. The music is in Carnatic style. The song is called as Manipravalam which is a mixture of Sanskrit, Malayalam and Tamil language.